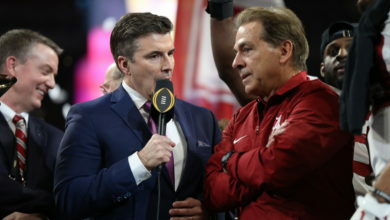 ESPN to Televise Alabama, Clemson and Georgia’s Spring Games; 18 Games Available across ESPN Networks - ESPN Press Room U.S.
ESPN will pull back the curtain for a sneak peek of the 2018 college football season when its networks carry 18 spring games throughout March and April as teams take the first step toward the College Football Playoff semifinals on ESPN (December 29). The five-week slate kicks off on Saturday, March 24 and continues with multiple games nearly every weekend, highlighting ESPN.com’s Way-Too-Early Top 25 heading into the 2018 season. No. 1 Clemson kicks off coverage on ESPN on Saturday, April 14 at 2:30 p.m. ET with Chris Fowler, Brock Huard and Tom Luginbill on the call from Memorial Stadium. No. 2 Alabama and No. 3 Georgia, the two teams left standing at the 2017 College Football Playoff National Championship, play their spring games back-to-back on ESPN, Saturday, April 21. Adnan Virk, Kirk Herbstreit, Joey Galloway and Holly Rowe will call the action live from Tuscaloosa at 2 p.m., with Bob Wischusen, Todd Blackledge and Maria Taylor following at 4 p.m. between the hedges in Athens. ESPN is surrounding No. 25 South Carolina’s Garnet-Black Spring Game with additional commentators and an ESPN.com writer to shadow and participate as referees throughout the day. Steve Coughlin, Cole Cubelic, Mike Golic, Jr., Booger McFarland, Jordan Rodgers and ESPN.com’s Ryan McGee, along with reporter Laura Rutledge, will take fans inside prep meetings, referee positioning & roles, as well as game calls. The ESPN referees will have hat cams at different points throughout the afternoon to give viewers a unique first-person perspective of the game. Longhorn Network will give Texas fans a full Forty Acres experience Saturday, April 21. Texas Softball (Oklahoma State, 1 p.m.) and Texas Baseball (New Orleans, 3:30 p.m.) precede spring game action and lead into Texas GameDay at 6:30 p.m. Kickoff inside DKR-Texas Memorial Stadium is at 7:30 p.m. with full highlights and analysis on Texas GameDay Final, airing for an hour following the conclusion of the game. ACC Network Extra will carry spring games at No. 18 Florida State and Boston College as part of ESPN’s digital coverage. All 18 spring games will be available to stream on the ESPN App. In addition to televised action, ESPN.com will have additional spring game coverage to complement its daily coverage of the sport.